Another new 🎃 beer finally! This year the pumpkin brews aren’t as much in demand as last year or the year before. Seems like the “harvest” beers are the newest thing. More to follow about that but for now let’s stay focused on the great pumpkin 🎃 and his beers! Today I have tried what is described as a “scary good pumpkin ale”. Two roads brewing company, Stratford CT delivers us “Roadsmarys baby”. I have to say first off that I am not a fan of the name but I understand the play on words that go with the brewery and scary movies. This beer is brewed in rum barrels with vanilla beans, pumpkin and spices. The smell is subtle..a hint of rum and pumpkin the color is dark copper. The taste is nice, not overbearing with any of the ingredients and a slight after taste of rum but again not overpowering. It boasts a 6.8% alc content which is pretty good. 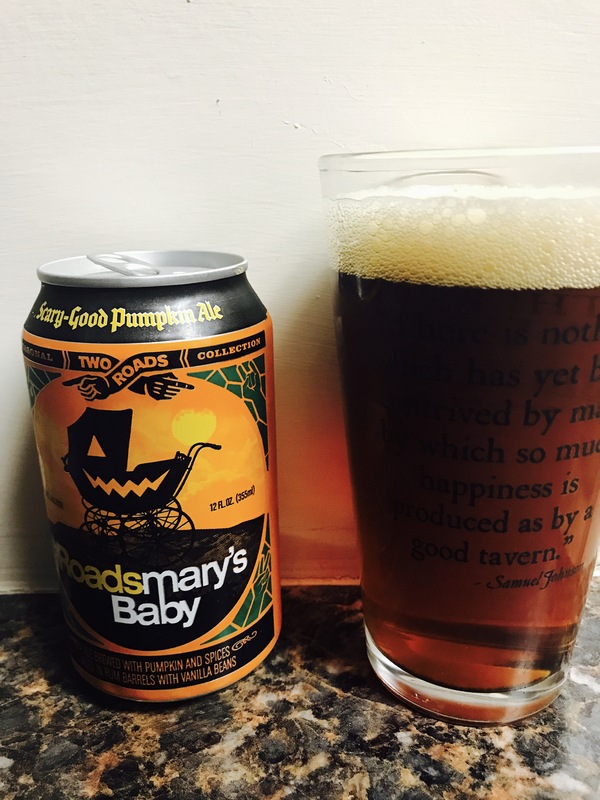 This is a solid pumpkin beer that even pumpkin beer haters might be able to enjoy. 3 stars, enjoy.